Yet another enjoyable stay in Newport! Brian and I had a great time talking with the Por Dos crew and meeting new friends, John & Lory. We loved their cruising stories, we brainstormed about solutions for Rode Trip’s hawse pipes, and we asked all we could think of about our southbound plans (if you haven’t already noticed these plans continuously change). I learned about flying fish. These unique creatures had been woven into cruising stories and I finally asked, “wait, so these fish actually end up on your boat! 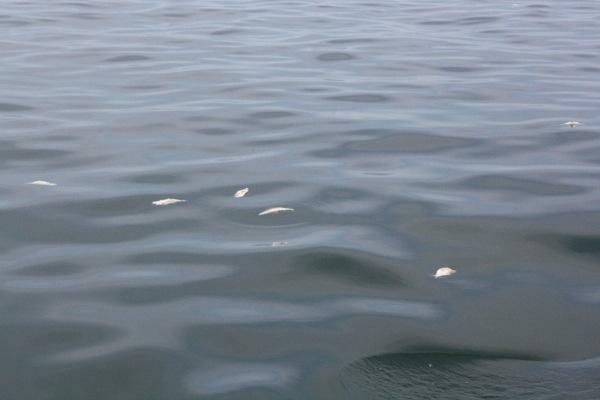 ?” Apparently the flying fish tend to land on deck at night time and can be quite a show during the day time. Whew! Glad to get a heads’ up about them! When I revealed my relief to Brian he shared that during his semester at sea he saw flying fish and they did land on deck every so often. I am eagerly anticipating our first sighting and likely to not screech now that I know they exist. 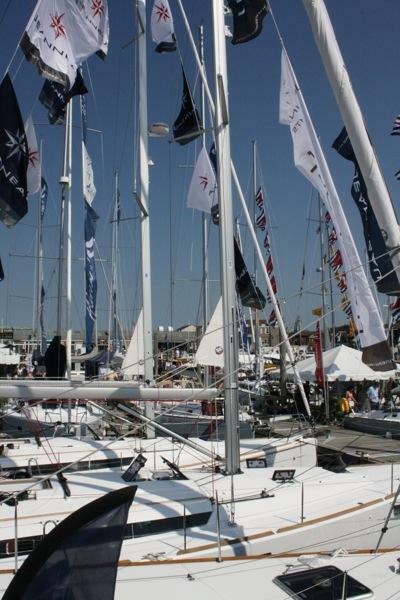 On Friday, September 14th we perused the Newport International Boat Show. It seems that every completed project on Rode Trip generates a new “to do” list along with a list of parts, tools, niceties, etc. So we had some checking-off to do at the boat show. We also toured some boats, found some new fabulous products, and stopped by the SSCA booth where we got even more ICW tips and suggested stopping points. 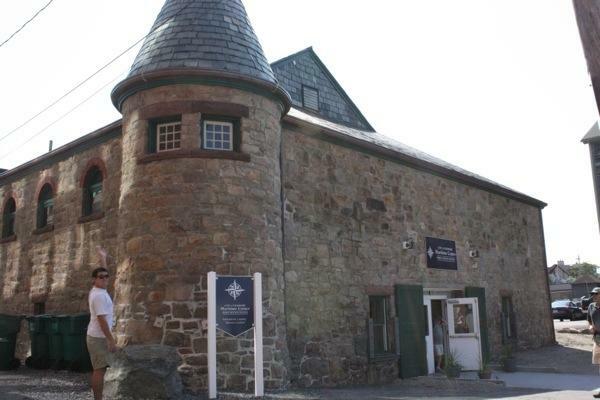 We made good use of the new Newport Maritime Center. This was a beautiful facility offering services for cruisers; free dinghy dockage, showers, laundry, wifi, lockers, ice, etc. Clean and provisioned we were ready for the high seas! Thanks to Mark for this great view of Rode Trip all ready to go! (Taken from atop Por Dos’ mast). We left Newport on Saturday morning, roughly 7:00am. 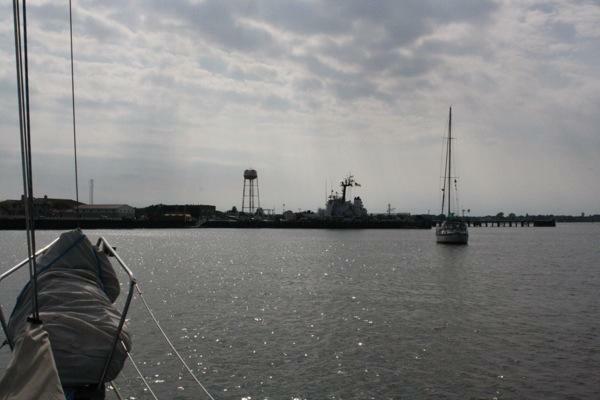 We were able to set sail right away with a northwest wind pushing us out of the harbor. 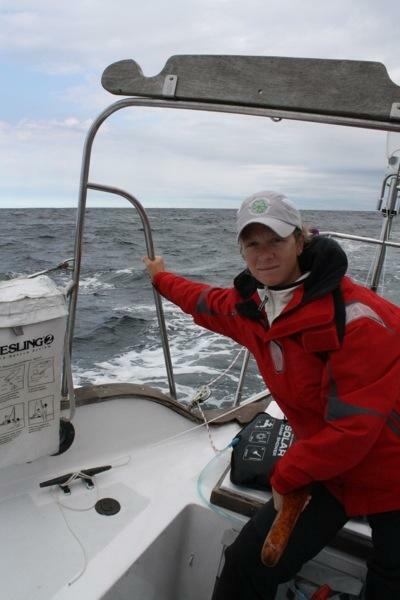 For about three hours we had steady 10-15 knot winds, as we approached Block Island the wind built and the seas rose. The remainder of our Saturday we sailed in 15-20 knot winds with two reefs in the main and the stay sail up. We were moving about 6-7 knots the entire time but were much too uncomfortable to appreciate this speed. Rode Trip was getting knocked around in 8 foot seas, water was crashing up against the hull and splashing everything on deck. I was a sick puppy…headaches, nausea, bouts of the sweats…I moved around like a zombie from bunk to cockpit, cockpit to bunk. Somehow, though, I managed to get done what needed doing. Brian doesn’t really get seasick which is a blessing, although he probably was “sick” of my snippety responses and uninterested attitude. Very early on Sunday morning, the wind eased. When I awoke for my 8:00am shift the sun was shining, the skies were clear, the seas had subsided to 3-5 feet, and we had a north wind about 10 knots for a reach. Ahhhh… So I clearly have not had any children, but as I began to sail on this fine morning I likened it to women having gone through childbirth and actually wanting to do it again and saying, “well you don’t remember that part.” I had no recollection of my rough Saturday and terrible seasickness, it was as if it hadn’t happened. And so this must be how babies keep being born and cruisers continue onward, one’s body and brain simply forget the hardship and relish in the reward. On Sunday night, during my 12:00pm-4:00am shift, while admiring the stars I may or may not have had a too close for comfort encounter with some unidentifiable GINORMOUS ship. I was watching two white lights with a red between them for sometime. Still a novice at night sailing, I told myself that this was a fishing boat (all boats at night are fishing boats) and determined that it was heading in my same direction because I could see the red (port side) navigation light. The ship turned and seeing now only one white and still the red I determined we were running parallel. The windvane was hard at work steering and I decided to hold the course for a bit longer as parallel was not necessarily a colliding course. The ship got closer and now I could clearly see the ship’s outline, with one white on the bow and one white on the stern (OH, not two lights up on fishing gear…hmmm). This was no fishing boat, it was (once again) a GINORMOUS ship very near to Rode Trip. Yes, we were running parallel. I got a bit antsy, rightfully so, and manually steered to port to try to put some space between us. The ship continued on it’s course and all was well. While recalling this event to Brian, he shared that during semester at sea anytime a ship was spotted within 3 miles of the Corwith Cramer crew had a to alert and/or awake the captain. He also shared that I should have been scared having just survived a near death experience! Well, now I know that fishing boats don’t light their gear, sometimes fishing boats are really cargo ships or airplanes…and I’ll take a review of The One-Minute Guide to the Rules of the Road: Rules 23-31 with descriptions and depictions of navigation lights. Nothing like learning by doing! On Monday (now the days/hours start blending together) our wind stopped. We hadn’t been able to turn towards NJ as we’d predicted because the wind stayed northwest. We were approximately 52 miles from Cape May, had determined that we needed to anchor at Cape May to avoid the very strong wind prediction for Tuesday and did not want to arrive in the dark. So we fired up the motor. Oh, that awful sound after sailing! Thanks our trusty Perkins, however, we were able to make a direct, windless route to Cape May. 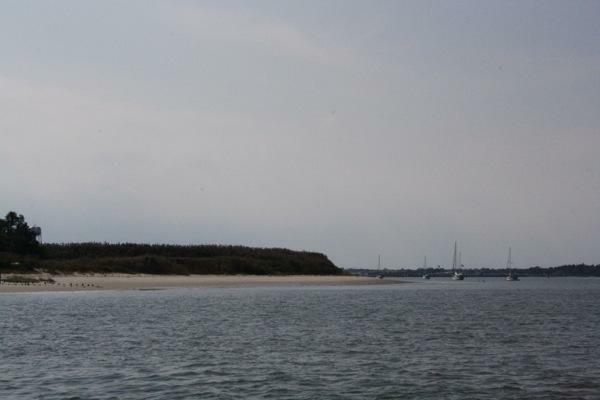 We anchored near the Coast Guard Station at Cape May Harbor. Another review of the forecast tells us we’ll be staying put for several days to hunker down for wind on Tues-Wed and then await the best opportunity to sail the Delaware Bay as comfortably as possible. 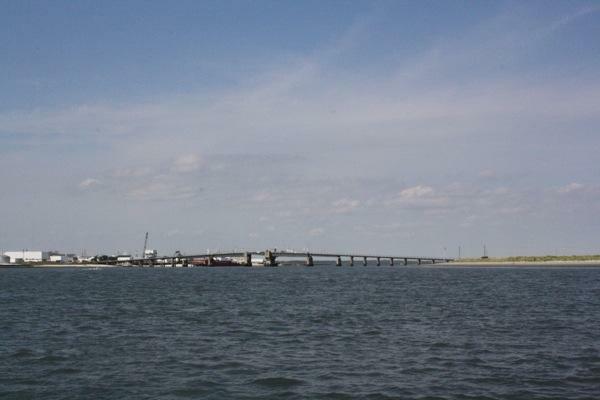 We ran the bridge (below) at the Cape May 10-Miler, March 2010. Hey my good friend Mary works at that CG Base in Cape May. If you are in town for a few days and you want someone to meet up with, let me know. I’m sure she’d love to grab drinks and listen to your sea stories! Saturday was rough here in Raritan Bay. (NJ) Gusty and some building fetch. Since I had a choice of sleeping on the mooring or at home. I went home. glad to hear you are well settled for the night. We are on a toronado watch. 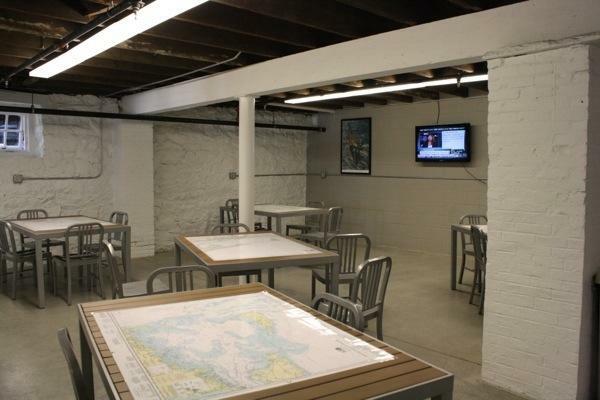 I am glad we didn’t go up the Hudson because we would have to be back for our Advance Piloting Class tomorrow night. 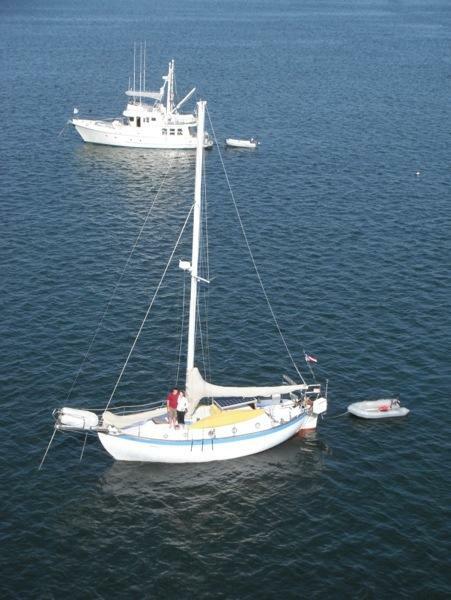 When we did our overnight passage from Block, we needed to use our engine; we had light winds on the nose. We found a ton of large cargo ships anchored near the Ambrose channel waiting for morning. Our course was to go thru that area; we made changes closer to land. An of course when we saw them way off in the distance we thought they were fishing boats. But no they we big boats to be respected. 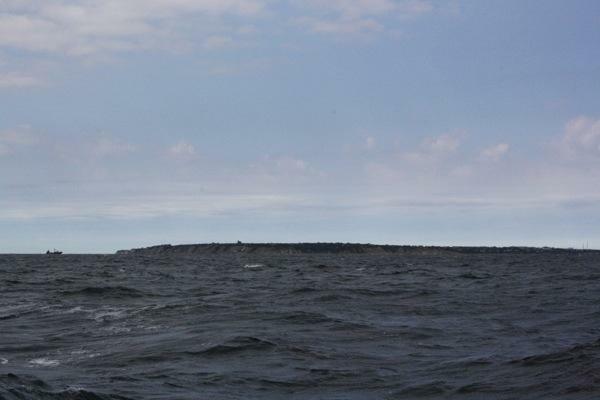 Since they were anchored out, the Ambrose Channel was quiet as we travelled toward our home port. Enjoy Cape May. And may you have good wind on your next leg. Hey guys, one more thing – get an AIS app for your phone or iPad. I use MarineTraffic ($3.99), but there are some free ones that are ok. All those big guys are required to transmit on AIS – they will even transmit when they are at anchor. It will help you avoid those “near death” experiences, at least during times when you are in cell-range. There’s no way to have the apps alert you to a ship’s presence, but if you monitor the app, you will always know where the commercial traffic is, what speed and true direction they are going, and what they’re status is. I highly recommend! Sorry we missed seeing you! Hope you enjoy the NJ shore area. Sure, if you want to email us her contact info maybe we can connect tomorrow before we head out on Sat. Thanks for the tip! We’ve talked about AIS with other cruisers, I think Brian will try out the app.